Earlier this week we introduced our April nominees for the Hall of Fame. Today Rabin is back with his statistical analysis to help you out with your vote. If this is your first time reading, or if you need a reminder, here is a look back at the equation for ACTOR. Today we look at the lead actors in a comedy series. This month’s nominees are just about as strong as the heralded female leads class from March. Of the 100 eligible actors I ran the sample of, the nominees include the top four scorers, five of the top ten, and six of the top twenty. How do they stack up against each other? No, you are not reading that score next to Kelsey Grammer incorrectly. Grammer, as Frasier Crane in both Cheers and Frasier scores 155.79 in ACTOR, topping previously high scorer Lucille Ball in I Love Lucy. And not by a little bit either. In ACTOR terms, the difference between Grammer and Ball is the just a little bit less than Harriet Hilliard’s performance as Harriet Nelson in The Adventures of Ozzie and Harriet. Or, in human terms, 32.41. How do all of the lead acting nominees fall? Keep in mind, current nominees appear in purple, Hall of Fame inductees are in blue, and the rejects (sorry, Mr. Clooney) are in green. Every single one of the nominees this month rank above at least two Hall of Famers, Lauren Graham and Sarah Michelle Gellar. If you go by a theory that anyone who is better than the worst Hall of Famer should get in, you should first apologize to George Clooney, and second vote yes on everyone. For everyone else, here’s the breakdown. “That’s weird,” you say. “You have never grouped nominees in this section before. What gives, Andrew?” First off, I’m flattered that you care so much about my writing that you have become a continuity nerd about it. Thanks for reading! Follow me on Twitter! But yeah, you’re right. I’ve never done this before. But the content of this chart would have been the exact same as what appeared in four different charts, so what is the point of that? We also can address the issue of spinoffs because it pops up three times in this chart. In Cheers, Frasier Crane was a supporting character; he became a lead only in Frasier. Archie Bunker was the lead in both All in the Family and Archie Bunker’s Place. And Lou Grant was the male lead in both The Mary Tyler Moore Show and Lou Grant. So what counts? 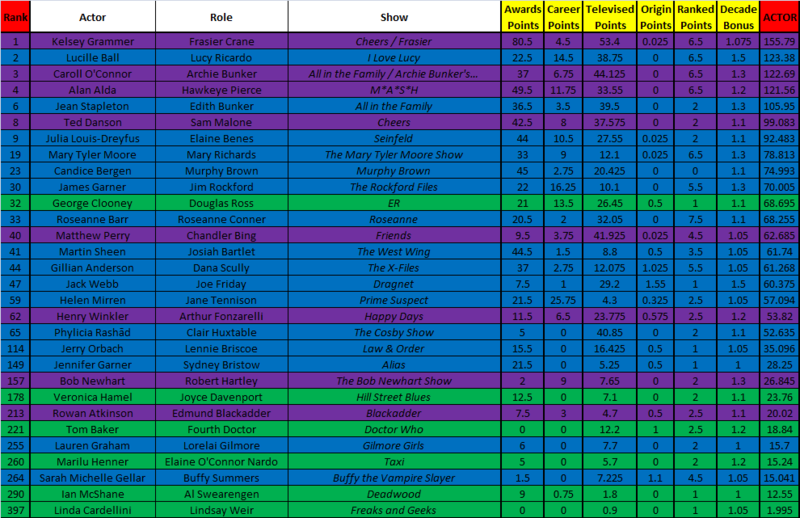 For the statistical purposes, any comedy where the actor was, at some point, a series regular as that character counts. So Grammer gets credit for episodes, ratings, and awards for the time he was on Cheers (but not the seasons before he arrived) as well as for Frasier. However, Asner is only credited with MTM, his time on Lou Grant was counted separately in the lead actor in a drama rankings (he ranked 18th). This is not new this month, I have used the same method previously with actors such as James Spader (The Practice/Boston Legal), Cloris Leachman (MTM/Phyllis), and Valerie Harper (MTM/Rhoda) among others. However, this is the first time the issue has come up with a nominee, so I wanted to discuss it. Regardless of how you feel about this method for the statistics, these four are all easy yes votes. It is easy to understand why Grammer, O’Connor, Alda, and Danson would rank in the top four, as they are all legendary television actors in their iconic roles. Could Matthew Perry BE more of a Hall of Famer? For what it is worth, Perry as Bing ranks second among Friends men, with Matt LeBlanc landing seventh (thanks, in part, to Joey) and David Schwimmer taking 17th. I do not think Chandler Bing rises to the iconic level of many of the other nominees, but he was often the strongest part of one of the biggest series in the last twenty years. Another yes. Speaking of iconic roles, few roles have grown from supporting character legendary lead without the benefit of a spinoff like Henry Winkler’s Fonz. Another yes vote for a character that still defines cool. Look, I don’t want to talk about what this looks like just as much as you don’t. The truth is, time has looked upon Newhart’s first sitcom far kinder than awards at the time; his overall awards haul was two Golden Globe nominations. For the record, Newhart’s other leading role in Newhart ranks 45th. The numbers just are not there for a firm yes vote, so I will put this one in the maybe column. I have said before, I do not think ACTOR treats British stars fairly, thanks to their low episode counts. Atkinson overcomes this a bit and actually falls between two fairly well regarded leads. The numbers are, again, too low for a yes, but Atkinson definitely deserves some consideration. That leaves Grammer, O’Connor, Alda, Danson, Perry, and Winkler as yes recommendations, and Newhart and Atkinson as borderline nominees, with no firm no picks.